This flavour filled vegan, gluten free recipe is the perfect antidote to the cold winter weather and is a real crowd pleaser. 1. Preheat the oven to 200°C, gas mark 6. Put the cauliflower, butternut and sweet potato and 1 tbsp of the oil on a baking tray and toss to coat. Cover with foil and roast for 20 minutes, then uncover and roast for a further 20 minutes, until very tender and lightly browned. 2. Meanwhile, heat the remaining 1 tbsp of oil in a saucepan, add the onion and garlic and cook for 5 minutes. Add the rice and ras el hanout and cook for a minute; stir in 500ml hot water and bring to the boil. Cover and cook for 10 minutes, then add the chick peas; cover and cook for a further 10-15 minutes until the rice is tender and the water has been absorbed. 3. 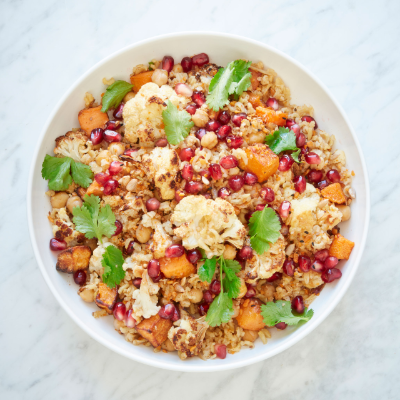 Combine the rice and roasted vegetables and transfer to a large serving platter. Leave to sit for 5 minutes, then scatter with the pomegranate seeds, dukkah and coriander to serve.